Since January, 2018, I’ve shared the fun times we’ve had traveling in our Class A Tiffin Allegro. Hope you’ve enjoyed them and I’ve encouraged you to take to the roads. This month I want to warn you of the brutal truth. RV adventures are not always fun. Most of the time, yes! But just like anything else in life, there are difficulties. 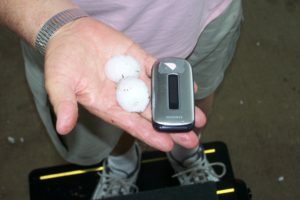 This is my husband holding golf ball sized hail that pelted our RV in Ardmore, OK in the month of May. 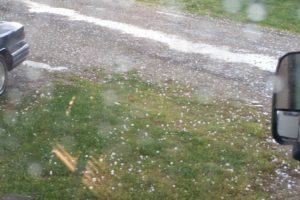 We got damage on our motor home as well as our tow car. This picture is from seven years ago as you can tell by the ancient cell phone. The front side mirror of the RV is visible in this picture and the collection of hail on the road and our RV site. Unfortunately, not many parking places provide covered protection in the camp. 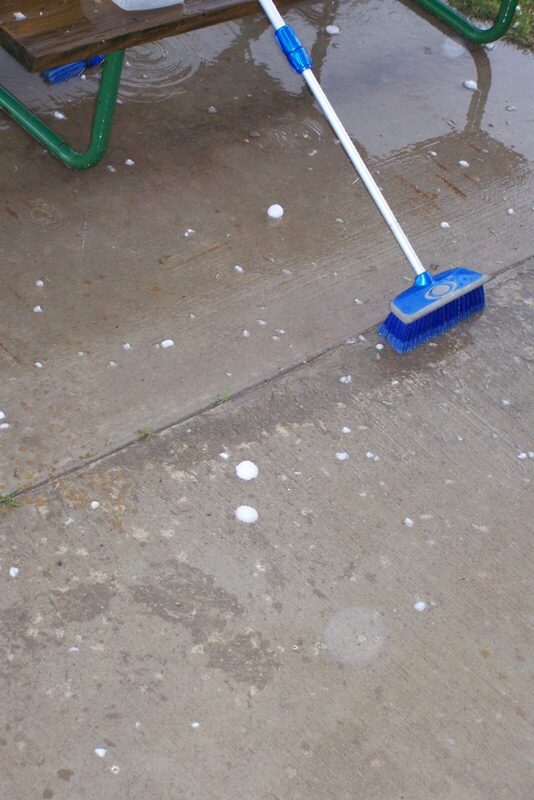 So if it hails, it hails. The picnic table at our site is our responsibility to keep clean. 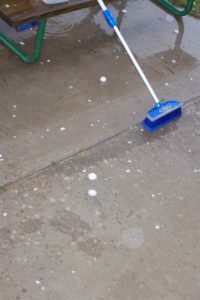 Joe will sweep up when it quits hailing. But the good news is, no calamity is worth giving up the RV adventure.